As you can imagine there are lots of London conference venues to choose from - in fact the choice can be quite bewildering! Getting your choice of conference venue right is essential to the success of the event, as it will not only set the tone for your whole conference but also take the biggest chunk out of your budget as well. So, here is the Conferences UK guide to choosing the best London conference venue for your event. #1 Don't Blow the Budget You need to be really clear on your budget before you starting checking any conference venues out as you really need to stick to it! Don't be afraid to look at venues that are slightly out of your comfortable range though as you may be able to negotiate a better rate by being flexible on the date or by offering them a multi-year contract. #2 Location, Location, Location In order to maximise attendance at your event, whether it is London or somewhere else, is to make sure that people can easily get there. Local transport links are really important, such as bus stops, train stations and even airports. It is also worth thinking about parking and valet services in case your attendees want to drive - although this can be a little difficult in the capital! Take the time to chat to local restaurants as well to see if they are open before or after your planned event and want to host a networking opportunity for you. #3 Size is Everything One of the most important things for any conference attendee is that they have enough space to sit comfortably, and a decent sized area to relax in at break-times. It is also important to keep in mind how your attendees prefer to take notes, as theatre type seating won't work for tech lovers who want to use their laptops! However, don't think that super-size is best as if you book a huge space for a small amount of people it will just look like half the attendees didn't bother to turn up. #4 Amenities Included Talk to your chosen venue before you start planning the finer details of your event, so that you can find out exactly what amenities are included in the price and what aren't. Make sure you take note of plug sockets, microphones and other AV equipment, wheelchair access and so on. If the venue provides an on-site catering service then make sure they can cater for allergies and so on, or ask if it is possible to use your chosen caterer instead. You should also make it clear exactly what exhibition space and break out spaces you have access to so that you don't plan something in an area that you cannot use on the day. #5 Staff Levels As a conference organiser, you will be really busy throughout the conference, making sure that everything is running OK, so it is a good idea to check with the venue to see if they have any staff that you can use - such as reception staff, waiting on staff and even security staff. It would also be a good idea to see If they have an onsite event manager whose experience and knowledge of the venue you can call on as well. Tech support might also be useful to organise as well so that if anything goes wrong during your conference you have people on hand who can help to fix it. #Branding is Key When you are choosing a venue, make sure you choose one that aligns with the image you want your conference to project. It is also a good idea to check with the venue as to whether there are any other events or conferences going on at the same time, to see if they clash with your event or not. It is also a fantastic idea to ask if there are any branding opportunities within the venue that you can take advantage of - such as in-house plasma screens and lift walls. 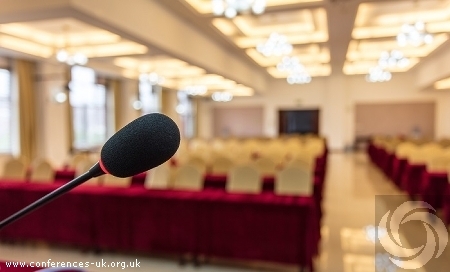 If you are in the process of organising an event and looking for conference centres London, then get in touch with the experienced team at Conferences UK today.